Tellas was born in Cagliari, Sardinia, in 1985 and he studied in Bologna, at the Academy of Fine Arts.Grown up in Sardinian’s harsh lands, Tellas’ research is based on a non-urban aesthetics, his works are a personal and intimate vision of the elements of natural landscapes. A meditative process that combines space and shape characterise his work. All his works can be seen as studies performed on a wide array of “supports”, from a big wall, a piece of paper or a canvas to an installation like the one created for the project “Spettro”. 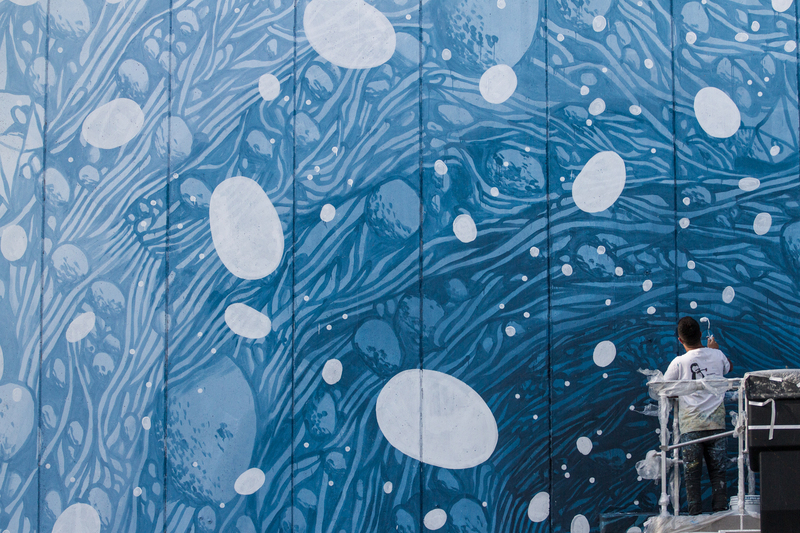 Listed as one of the 25 most interesting street artists worldwide by the Huffington Post US in 2014, Tellas develops his art in various fields: drawing, painting, installations, printing techniques, audio-video productions. His last solo show “Tropico” opened in October 2017 at Magma Gallery in Bologna (Italy). Artworks are inspired by suggestions and memories of a long trip through the state of Queensland (Australia) where he also had the opportunity to work on different mural projects among which a big wallpainting called “The Barrier”, for the city of Townsville. In October 2016 he presented a new body of works for the solo exhibition “Clima Estremo” at Wunderkammern Gallery in Rome. In the same year he took part in the “Public” festival in Perth, Australia, “Upea16” in Finland and a collective show at Magma Danysz gallery in Paris. 2015 was the year of his first solo show “This quiet, harsh land”, hosted by the Mini Galerie in Amsterdam. Moreover, Tellas was featured in The Urban Contemporary Art Guide 2015 edit by Graffiti Art Magazine together with a selection of the 100 artists who hit the year 2015 worldwide. In November 2015, after his first collaboration with MARNI in 2011, he developed a brand new project with the italian fashion label for “Becoming MARNI”, presented at the 56th Venice Biennale. After one month long art residency in Brasil togheter with Roberto Ciredz, Tellas worked on public murals and installations which were recorded into the documentary “ A grande terra do Sertão”. France is again home of another of his works in 2014 in Besançon for the “Bien Urbain” festival. In 2014, Tellas’ exhibitions take place at the Mini Galerie with “Apertura”, followed by his participation to “Artmosphere”, the first Street Art Biennale in Moscow, along with more than 70 artists from all over the world. Tellas’s art has been shown in several projects and exhibitions both on national and international ground. Among these, “La Tour Paris 13 Project” considered as one of the most innovative contemporary art projects. In 2012 he is invited at “Le 4 mur Festival” in Niort, France, where he also has the chance to showcase his personal exhibition called “Parasitism”. His participation to international festivals and collaborations with European and international contemporary artists are countless. In 2011, as mentioned, Tellas collaborates for the first time with MARNI and this collaboratio leads to the production of “on Marni”, an animated video, followed by the exhibition “Welcomes you to the world of Tellas” in occasion of Art Basel in Miami, Florida. Later that year, he holds the workshop “The Shape and the Space” at the K.I.R. in Stavanger, Norway during NUART festival. In 2010, he joins forces with the illustrator Martina Merlini and creates “Asylum”, a work in progress that explores the birds microcosm through different exhibitions. Tellas works and lives in Rome.